I’ve come to love Irina and her poems. She has become a master of the various poetry styles and has even developed a style of her own. Her book, Dreams on my Pillow, took me through her life, filled with wacky fun, sadness, happiness and all that goes with growing up. I think my favorite was about her experience during World War II, The Air Raid. Her father was in a German POW camp; she running with her sugar rations to shelter as the warning sirens blared. This one put me on the edge of my seat. For all of those that love poetry, I highly recommend this book. It’s a page turner and a keeper. It was just published on Amazon, so the image doesn’t show up, but if you click on the link above, you’ll find it. What an outstanding review. I know who I want to review my next book.,Both you and Irina are incredible ladies and talented writers. You are also an incredible writer, Kevin. Get going on your book. You know you can call on me if you need help publishing. Greg, thanks so much for liking this post. Back from my trip and trying to catch up. You are so welcome, Irina. Aguileana, that tickles me happy. I know you’ll love it. I don’t normally do groaners like this (lying). 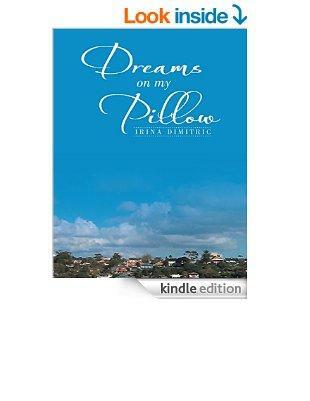 Thank you for bringing my attention to Dreams on My Pillow. I’ve been wanting a good book of poems. I so admire poets. They say in 6 words what I manage to get across in 60 — on a good day. Beulah, you are so welcome. I’ve know Irina for many years in the old Gather group. Slowly finding my friends and their works here on WP, plus finding wonderful new friends like you. Thanks, Pam, for the lovely review of my book. Much appreciated. I don’t even know the way I stopped up right here, however I assumed this post used to be good. Irina is a wonderful poet and so nice to see her book getting wonderful recognition!